The objective of the Research program is to Describe, understand and explain the impact of interaction among individual, group and organizational factors on the ties between collaboration and innovation in health care services in Canada and other countries. 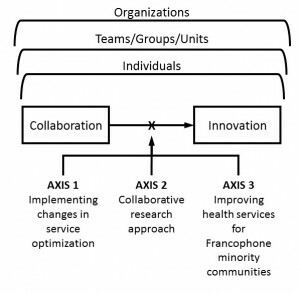 It covers three complementary components: (1) the implementation of service optimization changes; (2) a collaborative research approach; (3) improved health services for Francophone minority communities. By emphasizing collaboration as a human phenomenon whereby the people involved (patients/families, administrators, health professionals and researchers) interact in achieving a shared objective, the program highlights the levers and obstacles of the driving force behind health services. By focussing on the determinants underlying the creation, establishment and appropriation of the innovation required by health services performance, the research program acknowledges the vast complexity of the issue. For that reason, it has gleaned many of its basic precepts from the fields of industrial and organizational psychology, organizational management and health care service organization, in which it will also make its mark. The figure opposite shows the topics on which the Research Chair program plans to enlist the collaborative efforts of healthcare system stakeholders in order to achieve promising and sustainable innovations. The issue of innovation determinants is complex. It is compounded by pressures brought to bear in a context where the health care system must adapt to the increasingly complex needs of patients (Waibel, Henio, Aller, Vargas, & Vázquez, 2012) but also of all the other players involved. The context changes how the causes (such as collaboration) influence effects (such as innovation) (Johns, 2006). Individuals, teams, groups, units and organizations are all intertwined, which demands a multi-level understanding of the phenomena under study (Kozlowski & Klein, 2000). Connecting these components based on the various levels demands a multidisciplinary research approach, with contributions from the fields of industrial and organizational psychology, management and health care services documentation. The Chair’s work will therefore encompass these three areas. Collaboration is the essence of health care service organization and requires the participation of researchers, administrators, health care professionals, technicians, support staff and, obviously, patients and their family members. Collaboration is an evolving process whereby two or more social entities actively and mutually engage in activities designed to achieve a common goal (Bedwell et al., 2012). Innovation is a process that the healthcare system can use to meet the changing needs of pa-tients. Many determinants must be taken into account (Fleuren, Wiefferink, & Paulussen, 2004). For example, innovation can be gradual or radical, which determines how approaches to managing such change may differ (McDermott & O’Connor, 2002). Moreover, compared to continuous improvement, a project management approach fosters richer collaboration (Chiocchio & Richer, 2015). At an individual level, flexible individuals who are capable of adapting to circumstances generate more new ideas (Howell & Boies, 2004), which is vital for innovation. At the group level, teams with a clear objective innovate more effectively. And teams able to engage in self-examination and adapt to circumstance foster innovation (Schippers, West, & Dawson, 2015). Lastly, organizational culture has an important influence on the innovation process (Hogan & Coote, 2014). Axis 1. Implementation of the changes involved in optimizing services is an emerging field of research. Changes in health care are frequent and complex (Plsek & Greenhalgh, 2001; Plsek & Wilson, 2001) both inside and among organizations (Bazzoli, Dynan, Burns, & Yap, 2004). For example, in hospitals, structures are changing from compartmentalized operational units to entities focused on patient processes (Brown et al., 2014; Reddeman et al., 2016; van Riet Paap et al., 2015; Vos et al., 2011). Among organizations, the emphasis centres on the effectiveness and efficiency of organizational coordination. In Ontario, patients want clear, easy, fast and practical transitions (Baker & Axler, 2015). The change process represents the biggest of the innovative health care service innovation initiatives (Bazzoli et al., 2004) where “human” issues like leading patient care teams (Lemieux-Charles & McGuire, 2006) or inter-professional distrust and conflicts are major obstacles (D’Amour, Ferrada-Videla, San Martin Rodriguez, & Beaulieu, 2005; D’Amour, Goulet, Ladadie, San Martin-Rodriguez, & Pineault, 2008; San Martin Rodriguez, Beaulieu, D’Amour, & Ferrada-Videla, 2005). Little is known about the relative effectiveness of the two major approaches used to introduce change in the health field: the gradual approach based on continuous improvement, and the radical approach based on pro-ject management. Few people question the paradigm of continuous improvement (Chiocchio, 2015b) and it tends to be applied in all circumstances. Radical change requires a project management approach (Chiocchio, Rabbat, & Lebel, 2015), which is rare in the case of “small” change projects (Chiocchio, 2015a) and problematic in the case of “large” hospital reorganization (Vos et al., 2011), infrastructure (Barlow & Koberle-Gaiser, 2009) and information technology (Heeks, 2006) projects. Axis 2. The patient-centred care concept has evolved since it first appeared in the 1950s (Uijen, Schers, Schellevis, & van den Bosch, 2012) and is spreading (Morgan & Yoder, 2012). A holistic, bio-logical-psychological-social outlook on patients, responsibility and decision-sharing, and the identification of shared goals have gained recognition since the early 2000s (Flagg, 2015; Mead & Bower, 2002; Uijen et al., 2012), but more progress is needed (Pomey, Ghadiri, Karazivan, Fernandez, & Clavel, 2015). For example, some believe that an even more productive partnership is possible and necessary in terms of the role that patients play in their own care (Karazivan et al., 2015; Pomey, Flora, et al., 2015) and see their interaction with health care services as a learning process (Pomey, Ghadiri, et al., 2015). But two additional steps are necessary: (1) include the patient as a full partner in designing health care services and (2) include the patient in designing and implementing research on the effectiveness of the health care system. These two factors are the main focus of interest under this Component of the Chair program. Collaborative research is an appealing means of taking the needs of patients and their family members into account (Las Nueces, Hacker, DiGirolamo, & Hicks, 2012). However, patient involvement in research varies considerably in quality and quantity (Viswanathan et al., 2004). Axis 3. Much remains to be learned about improving the health care services delivered to minority communities (Karliner, Napoles-Springer, Schillinger, Bibbins-Domingo, & Pérez-Stable, 2008; Miranda et al., 2003). For example, language support programs can improve access to health care services (Chen, Vargas-Bustamante, & Ortega, 2012). However, the complexity involved demands varied and robust underpinnings. In this respect, the concept of cultural competency – a series of congruent behaviours, attitudes and policies that take shape in a system, agency or among professionals and allows the system, agency or professionals to work effectively in intercultural situations (Cross, 1989) – is key to understanding the effect of patient and health care professional interactions on access to services, but also to understanding organizational and systemic competencies (Truong, Paradies, & Priest, 2014). For example, we know that navigator programs foster patient empowerment and trust in institutions (Na-tale‐Pereira, Enard, Nevarez, & Jones, 2011). These actions must be supported by the organizations that deploy them, culturally adapted to the specific needs of the populations concerned, and carried out by multidisciplinary teams, with simultaneous separate identification of the specific effects of various determinants (Chin et al., 2012). For example, language is a major mental health care obstacle for Fran-co-Ontarians (Tempier, Bouattane, & Hirdes, 2015), but rural accessibility is the main obstacle among Franco-Manitobans (de Rocquigny, 2014). Baker, G. R., & Axler, R. (2015). Creating A High Performing Healthcare System for Ontario: Evidence Supporting Strategic Changes in Ontario. Barlow, J., & Koberle-Gaiser, M. (2009). Delivering innovation in hospital construction: Contracts and collaboration in the UK’s private finance initiative hospitals program. Bazzoli, G. J., Dynan, L., Burns, L. R., & Yap, C. (2004). Two decades of organizational change in health care: what have we learned? Medical Care Research and Review, 61(3), 247-331. Brown, C., Chamberlain, P., Saldana, L., Padgett, C., Wang, W., & Cruden, G. (2014). Evaluation of two implementation strategies in 51 child county public service systems in two states: results of a cluster randomized head-to-head implementation trial. Implementation Science, 9(1), 134. Chen, J., Vargas-Bustamante, A., & Ortega, A. N. (2012). Health care expenditures among Asian American subgroups. Medical Care Research and Review, 1077558712465773. Chin, M. H., Clarke, A. R., Nocon, R. S., Casey, A. A., Goddu, A. P., Keesecker, N. M., & Cook, S. C. (2012). A roadmap and best practices for organizations to reduce racial and ethnic disparities in health care. Journal of general internal medicine, 27(8), 992-1000. Chiocchio, F. (2015a, 15-18 May). Change (mis)management: The role of healthcare professionals. Paper presented at the 6th Annual Canadian Winter School for Quality and Safety in Radiation Oncology, Kelowna, BC. Chiocchio, F. (2015b, April 15). The importance of healthcare project teams in managing innovation and change. Paper presented at the Medical Rounds Invited Speaker Series, Cancer Center, The Ottawa Hospital, Ottawa, Canada. Chiocchio, F., Rabbat, F.-X., & Lebel, P. (2015). Multi-level efficacy evidence of a combined interprofessional collaboration and project management training program for healthcare project teams. Project Management Journal, 46(4), 20-34. Chiocchio, F., & Richer, M.-C. (2015). From multi-professional to trans-professional healthcare teams: The critical role of innovation projects. In S.
Gurtner & K. Soyez (Eds. ), Challenges and Opportunities in Health Care Management (pp. 161-169). Cham, Switzerland: Springer. Cross, T. L. (1989). Towards a Culturally Competent System of Care: A Monograph on Effective Services for Minority Children Who Are Severely Emotionally Disturbed. D’Amour, D., Ferrada-Videla, M., San Martin Rodriguez, L., & Beaulieu, M.-D. (2005). The conceptual basis for interprofessional collaboration: Core concepts and theoretical frameworks. Journal of Interprofessional Care, 19(2), 116-131. D’Amour, D., Goulet, L., Ladadie, J.-F., San Martin-Rodriguez, L., & Pineault, R. (2008). A model of typology of collaboration between professional healthcare organizations. BMC Health Services Research, 8, 188.
de Rocquigny, J. (2014). Are There Mental Health Differences Between Francophone and Non-Francophone Populations in Manitoba?/Y at-il des différences de santé mentale entre les populations francophones et non francophones du Manitoba? Canadian journal of psychiatry, 59(7), 366. Flagg, A. J. (2015). The Role of Patient-Centered Care in Nursing. Nursing Clinics of North America, 50(1), 75-86. Heeks, R. (2006). Health information systems: Failure, success and improvisation. International journal of medical informatics, 75(2), 125-137. Hogan, S. J., & Coote, L. V. (2014). Organizational culture, innovation, and performance: A test of Schein’s model. Journal of Business Research, 67(8), 1609-1621. Johns, G. (2006). The essential impact of context on organizational behavior. Academy of Management Review, 31(2), 386-408. Karliner, L. S., Napoles-Springer, A. M., Schillinger, D., Bibbins-Domingo, K., & Pérez-Stable, E. J. (2008). Identification of limited English proficient patients in clinical care. Journal of general internal medicine, 23(10), 1555-1560. Kozlowski, S. W. J., & Klein, K. J. (2000). A multilevel approach to theory and research in organizations: Contextual, temporal, and emergent processes. In K. K. Klein & S. W. J. Kozlowski (Eds. ), Multilevel theory, research, and methods in organizations (pp. 3-90). San Francisco: Jossey-Bass. Las Nueces, D., Hacker, K., DiGirolamo, A., & Hicks, L. S. (2012). A systematic review of community‐based participatory research to enhance clinical trials in racial and ethnic minority groups. Health services research, 47(3pt2), 1363-1386. Miranda, J., Duan, N., Sherbourne, C., Schoenbaum, M., Lagomasino, I., Jackson‐Triche, M., & Wells, K. B. (2003). Improving care for minorities: can quality improvement interventions improve care and outcomes for depressed minorities? Results of a randomized, controlled trial. Health services research, 38(2), 613-630. Morgan, S., & Yoder, L. H. (2012). A concept analysis of person-centered care. Journal of Holistic Nursing, 30(1), 6-15. Natale‐Pereira, A., Enard, K. R., Nevarez, L., & Jones, L. A. (2011). The role of patient navigators in eliminating health disparities. Cancer, 117(S15), 3541-3550. Plsek, P. E., & Greenhalgh, T. (2001). The challenge of complexity in health care. British Medical Journal, 323(7313), 625. Plsek, P. E., & Wilson, T. (2001). Complexity, leadership, and management in healthcare organisations. British Medical Journal, 323(7315), 746. Pomey, M.-P., Flora, L., Karazivan, P., Dumez, V., Lebel, P., Vanier, M.-C., . . . Jouet, E. (2015). Le «Montreal model»: enjeux du partenariat relationnel entre patients et professionnels de la santé. Santé publique, 1(HS), 41-50. Pomey, M.-P., Ghadiri, D. P., Karazivan, P., Fernandez, N., & Clavel, N. (2015). Patients as Partners: A Qualitative Study of Patients’ Engagement in Their Health Care. Reddeman, L., Foxcroft, S., Gutierrez, E., Hart, M., Lockhart, E., Mendelsohn, M., . . . Brundage, M. (2016). Quality Improvement in Patient Radiation Treatment in Ontario: Use of a Change Management Approach to Increase Peer Review Activities. Journal of Oncology Practice, 12(1). San Martin Rodriguez, L., Beaulieu, M.-D., D’Amour, D., & Ferrada-Videla, M. (2005). The determinants of successful collaboration: A review of theoretical and empirical studies. Journal of Interprofessional Care, 19(2), 132-147. Tempier, R., Bouattane, E. M., & Hirdes, J. P. (2015). Access to psychiatrists by French-speaking patients in Ontario hospitals 2005 to 2013. Paper presented at the Healthcare Management Forum. Truong, M., Paradies, Y., & Priest, N. (2014). Interventions to improve cultural competency in healthcare: a systematic review of reviews. BMC Health Services Research, 14(1), 1. Uijen, A. A., Schers, H. J., Schellevis, F. G., & van den Bosch, W. J. (2012). How unique is continuity of care? A review of continuity and related concepts. Family practice, 29(3), 264-271.
van Riet Paap, J., Vernooij-Dassen, M., Sommerbakk, R., Moyle, W., Hjermstad, M., Leppert, W., . . . team, o. b. o. t. I. r. (2015). Implementation of improvement strategies in palliative care: an integrative review. Implementation Science, 10(1), 103. Viswanathan, M., Ammerman, A., Eng, E., Garlehner, G., Lohr, K. N., Griffith, D., . . . Lux, L. (2004). Community‐based participatory research: Assessing the evidence: Summary. Vos, L., Chalmers, S. E., Dückers, M. L., Groenewegen, P. P., Wagner, C., & Van Merode, G. G. (2011). Towards an organisation-wide process-oriented organisation of care: A literature review. Implement Sci, 6(8), 1-14.